Will I see Ayers Rock/Uluru from the balloon? No, Ayers Rock/Uluru is approximately 450 kms from Alice Springs. I am staying at Ayers Rock/Uluru, can you pick me up from there? No, you will need to stay the night before in Alice Springs. How many people will be in the balloon basket? 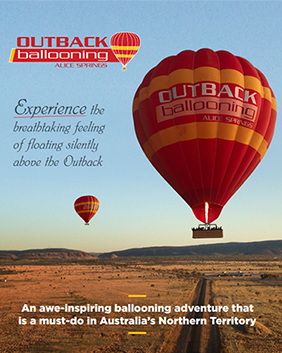 Outback Ballooning has a large fleet of balloons suitable for 2-4 people, up to 8, 12, 16, 20 and 24 people in one balloon depending on number of bookings on the day. Will our group be in the same basket? Can we book the night before? Yes, however we cannot always guarantee availability, so we suggest booking well in advance. We operate within the first 1000ft above the ground level. The weather will determine how high we fly on the morning. The balloon flight takes place approximately 15 kilometres to the south of Alice Springs adjacent to the MacDonnell Ranges and over the historic Owen Springs Cattle Station. You will see views of our amazing desert landscape and the ranges as far as the eye can see, early morning skies like nowhere else and if you are lucky, kangaroos, birds, wild camels and other wildlife that have been woken by the sounds of the burner. Flight distance will typically be between 10 and 20 kilometres. Do I have to help pack up the balloon? It is dusty in the Outback. Outdoor clothing (preferably not white if you want it to stay that way), long pants and hat or cap are recommended. Enclosed flat heel shoes are essential. It is no colder in the balloon than on the ground but it can be cooler before sunrise. Warm clothing may be necessary from approximately May to September. Loose items such as dangling jewellery and scarves are not permitted once passengers reach the launch site and dis-embark from the bus. You can bring a camera or phone to take photos. However, as there is limited space in the basket, backpacks and larger items will not be permitted on the flight. You will be required to leave these on the bus with the crew during the flight. Why do I have to pay the additional insurance charge as I have my own travel insurance? This is a mandatory Civil Aviation Safety Authority Insurance charge which applies to all passengers. Your personal travel insurance is not same type of insurance. I’m afraid of heights, I don’t know if I want to fly? Ballooning is one of the most natural and safest feelings you will ever experience. It is very different to looking over the edge of a tall building or a cliff. In fact, you don’t have to look down, you can just look out towards the horizon in awe of our amazing views in the middle of nowhere while you float gently in the breeze. Our baskets are approximately 1.2 metres high and very sturdy. You will not even notice when the balloon has taken off from the ground, it is very peaceful and calm. Once in the air, you do not feel like you are moving. If you decide on the launch site that you can’t go, we will not force you, you are able to stay on the ground with our crew and chase the balloon through the desert and meet up with everyone once the balloon lands. Unfortunately, because of our location, we are not able to take you back to town until the end of the tour. Absolutely! Statistically, flight is the safest mode of transportation and ballooning is statistically, the safest form of flight. Safety is our primary concern and our pilots will cancel if there are unsuitable weather conditions. The pilot’s decision with regard to flying conditions is final. You may then either re-book for another day or receive a full refund if you have prepaid through a third party. Ballooning is one of the smoothest and most gentle ways to fly. Early in the morning at sunrise there are no bumpy air pockets around and everything is very stable. The only bumps you should ever feel in a balloon are those few bumps sometimes felt on landing whilst the balloon comes to rest. Will I be cold during the flight? It is no colder in the balloon than it is on the ground, in fact it can be warmer once in the air with the burners. Because the balloon moves with the wind there is little or no wind chill experienced during flight. How loud are the burners? The burners can be quite loud, our crew does have earplugs available for those who have sensitive hearing. I fly out the same day, will I have enough time to join a balloon flight? As our balloon flights take place early morning, there is generally enough time once you have returned to your hotel to check out and make your way to the airport. The airport is only a 15-20 minute drive with little traffic. We are also able to offer airport drops as our flights take place out near the airport. Enquire at time of booking. Do I get a refund if you cancel my flight? If we cancel due to weather and you do not have another available morning to fly, yes you will receive a refund if you have booked through a third party. We will advise your agent that the flight has been cancelled due to adverse weather conditions and you will need to contact them directly. Payment for bookings made directly with us are not taken until the morning of your flight. Your credit card has been taken to secure the booking and will only be charged as per our cancellation policy. If there are kangaroos on the ground will the pilot be able to get closer? As the balloon is not “steered” in the conventional sense, it will depend on the height of the balloon at the time of the sighting. The balloon moves with the direction of the wind so if you are high then the pilot is not able to just make the balloon fly low in an instant. The winds tend to stratify in differing directions and altitudes which is how the pilot uses these varying currents to guide the balloon to an appropriate landing site. Should pregnant ladies go ballooning? Hot Air Balloon flights in Australia are at first light because this is the time of day that provides the optimum weather conditions for launching balloons. Depending on many operational factors, which vary each day, passengers may be on the ground or in the balloon when the sun is actually coming over the horizon or rising, either way they will still see an amazing dawn. Whilst there are no weight restrictions as such, passengers must be able to climb up and into the basket that is approximately 1.2 metres in height unaided using the basket foot holes. They need to be able to swing their legs over and hop in to a small compartment that is approximately 60 cm wide which will accommodate from 2-6 people side by side depending on the size of the basket and the number of people booked for that day. We do require the weight of every passenger. Minimum age recommended is 6yrs old. We can take 3-5 year olds but we do not recommend as they generally cannot see over the side of basket (1.2 metres high) and cannot be lifted up although they can look through foot holes. Also, the noise of the burners or the fire itself can scare them (recommend earplugs). However, you know your children and if after reading the this you would still like to take your 3-5 year old with you then we are happy to take them as well. We recommend that you allow up to 4 hours from pick-up time for our tour. Pick up times are approximately 1 hour before first light so vary throughout the year. As an example, in the middle of summer pickup times are around 4.15am and in the middle of winter around 5.45am. You will be advised the exact time when you book.